It’s not difficult to notice that Bill Wallace, ENV SP, M.ASCE, is a man of passion. Listen to him talk for two minutes about the importance of building sustainably in the modern world and it’s obvious. 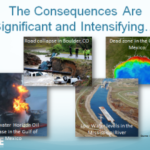 He brought his message to ASCE’s recent Sustainability Summit, delivering a keynote speech with a rousing call-to-action to civil engineers to respond to a new and changing set of environmental conditions. Afterward, Wallace – president of Wallace Futures Group LLC, the lead designer of the Envision infrastructure-rating system and a member of the ASCE Committee on Sustainability – spoke with ASCE News. He shared a lesson about civil engineering of the past, peered into the industry’s future, and emphasized the urgency of the present. In terms of sustainability, what do you see as the most important challenge that civil engineers face? For civil engineers working in the built environment, their world is being turned upside down. Throughout our history we’ve operated on the assumption of what scientists call stationarity: meaning that the environmental conditions of the past were good predictors of future conditions. That fundamental assumption, so critical to how we design, build and operate infrastructure, is no longer reliable. Worse, environmental conditions continue to change in ways that are not readily predictable. So the challenge before us is how to do what society expects us to do – continue to design, build, and operate safe and reliable infrastructure projects. But we’re supposed to do this while we’re busy overhauling our basic standards and practices to address these new and changing environmental conditions. I cannot imagine a bigger challenge. You said it’s not necessarily doom and gloom, that it could be a great opportunity for the industry. What have you seen from civil engineers that gives you some optimism that there are people out there who are embracing it as a chance to reshape the industry? First of all, our Committee on Sustainability is composed of people who really understand the issue, believe that the change needs to be made, are active in the profession, and are actually out there doing things. This Summit meeting is a good example. Here, our Committee brought together experts from the U.S. and abroad—project owners, the engineers, people from the finance and insurance industry—people who represent the key stakeholders. Our objective for this meeting was to tell them about this enormous challenge we and they face, and to lay out plans for tackling it. Second, with this enormous challenge comes enormous opportunity. I’ve been in the consulting engineering business for over 30 years. Since day one, I’ve been listening to a continuous industry whine that engineers aren’t being paid for the value they deliver. What value? You deliver commodity engineering services. Everything is spelled out in your handbooks. What did you expect? Now, things are very different. This new and changing operating environment – non-stationarity – requires a new form of engineer, one who is able to deal with substantial and unprecedented levels of change. The engineering handbooks don’t cover it. He or she has to meet the needs of the owner and do so while coming up with new standards and methods. That’s not commodity engineering. So for at least the next several decades, engineers will have the opportunity to rewrite the civil engineering body of knowledge. That’s exciting. So why now? Why can’t we start doing those things in 2020, 2025? 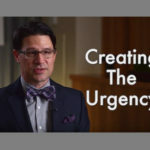 What is the urgency? As our other speakers have said, you’ve got a situation now where the more we wait, the worse things are going to get. Each and every day, civil engineers are putting in place long-lived infrastructure projects that have been designed based on the old assumptions of stationarity. For these projects, the best we can expect is that we get lucky and the project works without a hitch. But it’s highly likely that the project will not work as expected because of conditions that weren’t accounted for. Possible failure adds risk to public health, safety, and welfare. The longer we wait, the bigger the gap between our current standards and actual conditions. There are important things we must do now. First and foremost is education. Society is beginning to understand that climate change is real, human-caused, and needs to be addressed now, by both reducing greenhouse-gas emissions and adapting to a changing climate. Society is beginning to understand non-stationarity, at least implicitly. For civil engineers, it’s a different story. We’ve been assuming conditions of stationarity for so long that it’s become embedded in our DNA. In fact, our whole industry is manned by engineers who have been educated, tested, and licensed to design and deliver projects in accordance with stationarity-based standards and practices. Deviations from those standards and practices are viewed as professional negligence. The challenge is not only changing an engineering mindset, it’s about retooling an entire industry geared up since its inception to do commodity engineering. In addition, we have to educate our stakeholders, project owners, financial people, insurers, the public, and academia. They think assuming stationarity is OK because we engineers told them it’s OK. We need to help them connect the dots between the new and changing conditions and the assumptions we use to design and deliver infrastructure projects. You’d mentioned kind of a generational opportunity. Can you think of another time in the civil engineering practice when this kind of massive shift came up? I’d say the Industrial Revolution, starting in the mid-17th century. Prior to that time, life was really miserable for most people. Health and nutrition were very poor. Many children died at an early age. Families were living on a bare subsistence level. Then along came the Agricultural Revolution that brought new and more productive ways of crop rotation. New, high-calorie foods from the Americas were introduced. Now, people were healthier and needed to spend less time eking out a living. Home-based cottage industries sprang up to spin yarn and weave cloth. The Agricultural Revolution was the precursor to the Industrial Revolution. Enter the engineers. They quickly invented more efficient ways of cloth production. Cottage industries were displaced by factories that produced an ever-expanding array of goods for a growing population. Factories used water power to drive their machinery, but there were only so many suitable locations. So, engineers developed steam engines to power the factories. Transport of goods was also water-dependent, but that soon gave way to rail transportation developed and built by engineers. Road surfaces were reengineered to be more durable. As one author describe it, the Industrial Revolution was the greatest advancement of mankind since the domestication of animals. And engineers were full partners to that advancement. Do you feel like the next 30, 40, 50 years could be as transformative? I’d rephrase that question a bit. I’d ask, ‘Can we make the necessary transformation in the next 30, 40 or 50 years?’ We absolutely have to unless we think it’s OK to let societies crumble. Think about what happens if we follow a business-as-usual course. Right now we have credible predictions, backed by actual evidence, that temperatures will increase, sea levels are going to rise substantially, extended droughts and heat waves will be worse, and storms will be much more intense and devastating. The U.S. and other developed countries will probably be able to muddle through, but the rest of the world isn’t as strong and well-prepared. We know what’s causing these problems, we have good ideas on how to solve them, and we have lots of smart people, especially in our own engineering ranks, to work on the solutions. What’s holding us back is the will to take the necessary actions. And, we have ourselves to blame. Think about it. If all we need to know is contained in our engineering handbooks, then scientific inquiry becomes interesting but irrelevant. Transformation seems to be happening a little bit, I think. Well, yes. But, it’s been my observation that transformation happens in certain pockets where the right leadership is in place. [Summit co-chairs] Doug Sereno and Michael Mucha are good examples of that sort of leadership. Doug has brought the Envision sustainable infrastructure rating system into his work at the Port of Long Beach and makes sure that his infrastructure projects follow those principles. 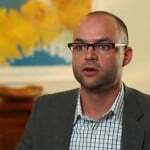 Michael at the Madison Sewerage District has substantially reduced non-point source pollutant runoff by managing the pollutant sources, thereby avoid a costly brick-and-mortar solution. The city of Denver is another good example. City leaders put in a light rail system that transformed the city. Instead of moving out and advancing urban sprawl, people are now coming back to the city. Each light rail stations is experiencing something called transit-oriented development. What Denver discovered is that people would much rather walk to a light rail station rather than drive a car and sit in traffic. 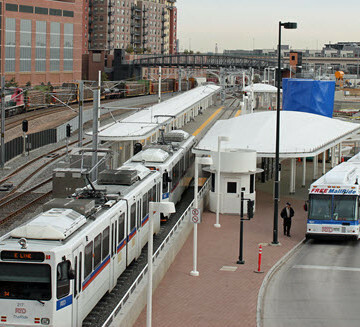 Back before the Denver light rail opened in 2000, it was being ridiculed for being wasteful. Now Denver is a model for other cities interested in transit-oriented development. Transformation can happen, but you have to have the right ingredients. You need the right leadership at the top and a collaborative team of engineers to get it done. You also need a public that understands the issue and is willing to make the investments. Last but not least, you need a forward-looking institution such as ASCE to convene the right people, communicate the issues effectively, and do what it can to expedite the transformation. Civil engineers, we have a problem.